Yesterday, as I gave you my recipe for vegan butternut squash risotto, I promised you guys a “mystery recipe” to come. As soon as I uttered those cryptic words, I realized that it wouldn’t be long before I spilled the beans. What I’m about to share is one of my favorite recent dinners from the CR kitchen, and I’m proud to say that I constructed it spontaneously, using ingredients from M’s produce box and a touch of imagination. What could I make, I wondered, that would put all of these things to good use? My first idea was to make a casserole dish, lining the bottom with the sliced polenta and stacking ingredients on top. Then, I decided that mini-stacks would be cuter. I wanted to use a similar approach as the Paradise Casserole—starchy base, black beans in center, mashed yams on top—but I wanted to add some fresh greens, and to mash and flavor the beans. What follows is my ultimate creation. 1) Peel and quarter the yams. Heat a large pot of water to a boil, and boil the yams until they’re fork tender. 2) While you wait for yams to cook, spray a large pan with coconut oil spray (or any cooking spray). 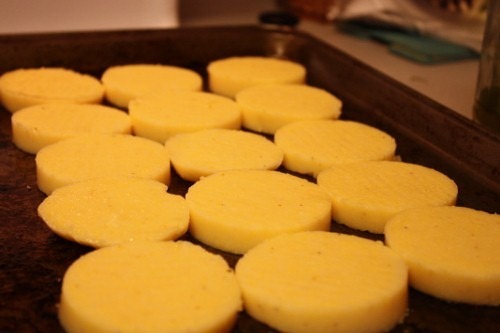 Cut the polenta into 1/2 inch rounds, and line them evenly on the tray. Pre-heat the oven to 350 degrees. 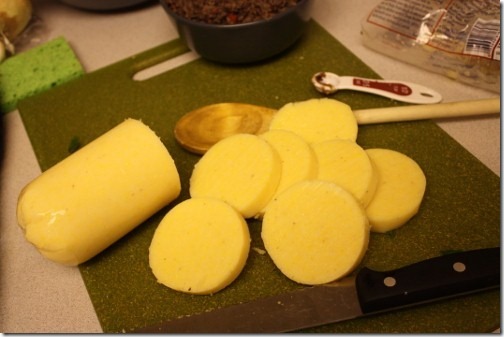 3) Remove yams from water, and drain. Using a potato masher or ricer, mash them with the miso (if desired), cinnamon, Earth Balance, and almond milk. Use only enough milk to achieve a thick consistency. Season to taste with salt and pepper. Set the mashed potatoes aside. 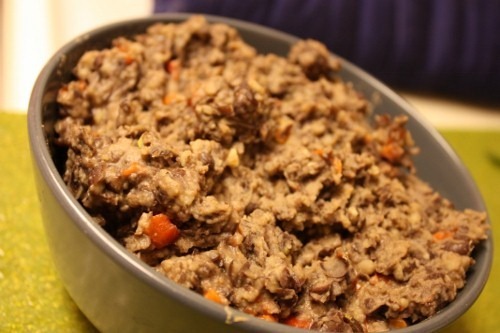 4) Place drained beans, peppers, garlic, cumin, coriander, agave, and salt and pepper to taste in a food processor, and process roughly, so that the beans are somewhat mushy but look like refried beans, rather than hummus (i.e., so they’re not totally without texture). This, by the way, is a great dip/spread, all on its own. 5) Heat 1 tbsp olive oil in a skillet and add the garlic. 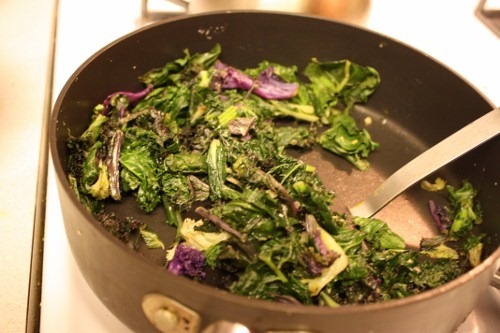 Stir garlic for about 1 minute, then add all of the chopped greens to the skillet. Cover it quickly so that the greens wilt down; two minutes later, begin sauteeing them until they’re tender and cooked through. Season to taste with salt and pepper. 6) To assemble the stacks, layer each polenta round with about tablespoon and a half of the black bean dip. 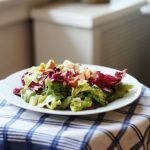 Next, place some greens on top of that–I found it easiest to do this with my hands–and press the greens down to adhere to the bean mix. 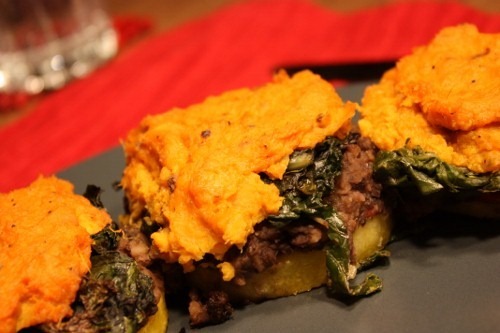 Finally, top the greens with a nice little heap of mashed yams. Again, use your hands if necessary. 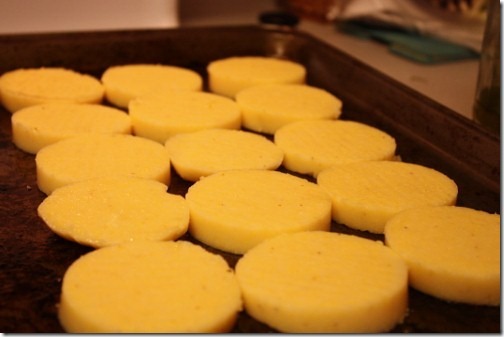 7) When stacks are assembled and uniform, place the tray in the oven and bake for 35-40 minutes. Serve. I found that 3-4 stacks was a very adequate serving size. They’ll be warm, tasty, and very cute looking when they emerge from the oven, like so! 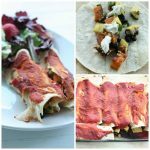 These, along with salad or any simple veggie side, make for a fabulous and easy dinner. Yes, I said easy! I know there are a lot of moving parts in this recipe, but it’s actually a breeze to make. You can prep the bean mix and potatoes ahead of time, and then all that’s left is wilting some greens and cutting the polenta. In fact, using the pre-made polenta in place of a cooked grain is a great way to save time and energy! These were such a hit that I made them again the next day—this time for a vegan cookoff and potluck dinner. Once again, they got enthusiastic reviews. I can’t recommend them enough for a healthy, simple, and filling meal. What’s the last recipe you came up with spontaneously? How do you get inspired by what’s in your fridge? what a great recipe and perfect for those random ingredients in the fridge! I can see why this would be a hit; it’s definitely unique and sounds packed with flavor. I think the most recent recipe that I made up on the spot was the quinoa recipe I posted today. I really just wanted a lot of cooked vegetables with something to make them stick, and thought about the spinach I had in the freezer and how to use it to make it not taste frozen. It was so good I made it two days later and served it to company who also loved it. These are adorable! I love little stacks of anything:) Slash thinking of recipes on the fly is fun, one time I thought up a random carrot cake quinoa recipe that turned out AMAZING. It ends up on my stove verrry often! I love when dinner is adorable! This sounds delish, I usually combine yams+black beans+greens+corn in an enchilada/tostada/taco type situation, but this polenta base is an awesome twist! I made a green olive hummus the other day because as I was deciding what flavor to make it, I opened the fridge and there was just enough left to make a tasty concoction. I was rather surprised that it turned out as well as it did! This recipe looks great! I have yet to cook with / make polenta! This recipe may be the one that makes a me a polenta-virgin no more! My last spontaneous recipe was black-eyed peas and farro (in the pressure cooker!) and wrapped in a collard green. Mmmmmmm. Such an inventive and absolutely delicious meal. You are so creative! 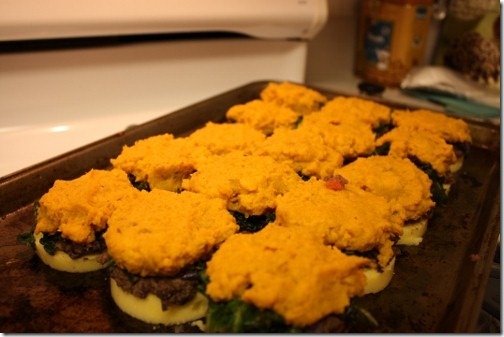 I *love* this idea – I am going to try it with teff “polenta” cakes (corn and I do not get along). Yummm! 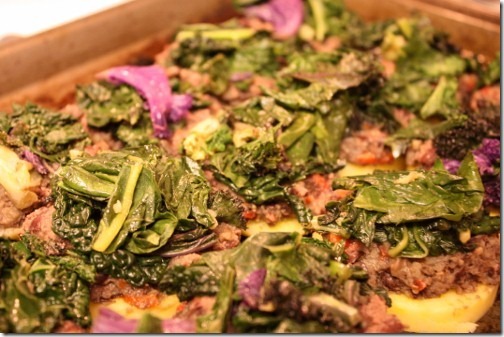 I absolutely love polenta and greens… I am going to have to try this in the next day or so! Great recipe, Gena! I love how you were inspired by something you loved at Candle and came up with this in your own house,by what you have on hand. I just did that yesterday with a savory recipe. It was kinda like the cans and jars and sauces were overtaking my cupboards so i went into project Use It Up and came up with a winner. I am writing the post and will have it up in a day or so. I hope you’re doing great at your first week at school! I cant believe you have the time to get super creative in the kitch AND blog about it. That’s the 2nd half…the uploading, writing copy, and documenting it that DOES take time. So thank you for taking the time! Your recipes just get better and better! Yum! Vie made the Candle Cafe casserole in the past, good stuf! Could this be a Best of 2011? I’m going to have to make this stat because I love every part of this dish! I may have to make this for my visiting in-laws this weekend. Also, stick a stack in a short mason jar and bring to work/school. You are becoming a cooked vegan MASTER! Looks ah-may-zing. oh my gosh! So flattered! Very clever and definitely cute!!! Sounds like some good ol’ soul food, full of warmth and comfort! Okay, now I want to make THESE for our dinner party! Chris and I love those premade polentas. I like to make them into mini pizzas too. Cute for sure! that looks so good. There’s something insanely comforting about beans and polenta together.. and for me, greens! Ever since I started the Ellie Project, I haven’t doing much spontaneous cooking…on the to-do list for this weekend! Wait, I guess it’s not spontaneous then. I know exactly how you feel! I wonder what time the post-bacc is going to leave me, but I’ll sure try. Those look incredible! (As does your risotto from yesterday). I love finding creative ways to use my favorite ingredients. Oh my goodness. This looks like one of the most colorful, delicious, and texturally interesting creations I’ve come across in a while. I’m a little concerned about the eating process. I assume you eat them with a fork, but I’m worried the greens will get in the way of clean fork-side cuts. I used a fork and a sharp knife to cut. I love this idea! I never seem to have time to check out my favorite blogs these days, but when I saw the title of this post, I had to come look at it! I will definitely be using this idea. I can imagine these flavors together, and it sounds amazing! A lot of the time I make fridge leftovers into soup. It’s just so easy. This look so ridiculously good! I have to say, I have a hard time cooking when I don’t have all the ingredients for a recipe. I need to be more spontaneous and creative. I have fresh Brussels sprouts and eggplant that I don’t know what to do with. Very cute indeed! I’m a big fan of creating new dishes based on what I have on hand. As much as it’s fun to try a beautiful and/or challenging recipe I may come across, it’s a drag if it means buying a bunch of new ingredients i wouldn’t otherwise buy and won’t likely use thereafter. So I’ve always been big on modifying my meals (or even other people’s recipes) based on what I’ve already got. That said, I’ve been in a bit of a rut lately as I’ve gotten busier – when my mind is otherwise occupied, it’s comforting to fall back on quick, easy and reliable favorites! If you are what you eat, I am zucchini and brown rice. Wonderful recipe, it looks perfect for me. Thanks! My last recipe was a creamy chickpea chowder using hemp seeds and tahini and it was a success. I usually pull out all the fresh ingredients that need to be used up soon and create something. I always love games like that – what can I make with what I have. I never do as good a job as this, though! They look so cute and sound delicious! Never had pimentos, though…hmm. Try steaming the sweet potatoes instead of boiling them. Steamed sweet potatoes contain 413% more antioxidants than boiled ones! Yum! Just slid this in the oven and it looks sooo good! I didn’t have tube polenta so instead, I just whipped up a batch of quick homemade using veg stock. Spread it on the bottom of a casserole dish and simply layered everything else on as well, once the polenta cooled and firmed up well. By the looks of it, it’s gonna be great! Thanks for another stellar recipe, Gena!! 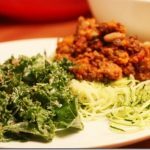 this is a great recipe Gena! 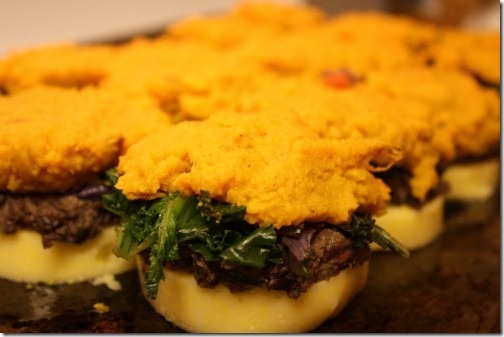 I’ve been slightly obsessed with polenta lately so this will be a great way to incorporate even more of it, yay! This dish was phenomenal!!!! One of my favorite vegan dishes to date-and you were right-surprisingly simple. Thank you so much! Can’t wait to uncover other goodies on your site! Hey there! I just made these tonight! 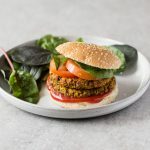 I love that it’s like vegan gourmet, yet simple–I felt like a chef! 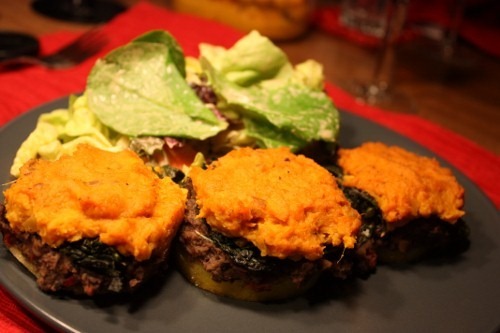 My littles devored the mashed sweet potatoes, and my littlest was scarfing down the extra kale bits! Soooo… Thank you heaps!!! You are welcome! One of my fave recipes.